SWOT offers professional managers an effective evaluative technique to aid the decision making process. It identifies, classifies and prioritises issues clearly, highlighting the problem in terms of key underlying issues. Decision makers are then able to find solutions. 2. Once the attributes for each section have been identified, the point of balance is determined. 3. Eventually the points of balance (strengths vs weaknesses and opportunities vs threats) can be plotted together. 4. The results will show the optimal direction for progress, building on strengths and opportunities, whilst eliminating weaknesses and threats. organising the important factors linked to success and failure in the business world. allowing complex ideas to be presented systematically. 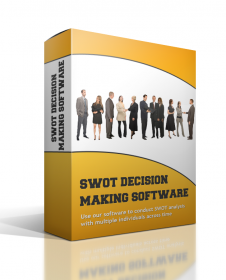 Spend a bit of time getting used to the SWOT online software as it has lots of hidden functionality. Once you get used to it, you'll love it!